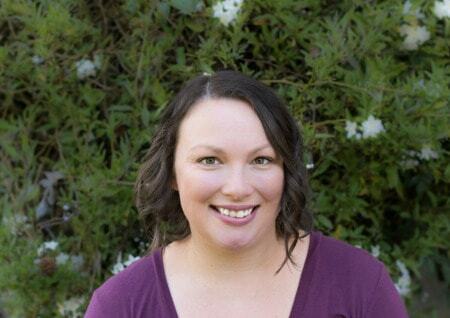 November 26, 2018 By Aileen Leave a Comment This post contains affiliate links. As an Amazon Associate and member of other affiliate programs, I earn from qualifying purchases. You don’t want to miss these soft baked sprinkle pudding cookies. 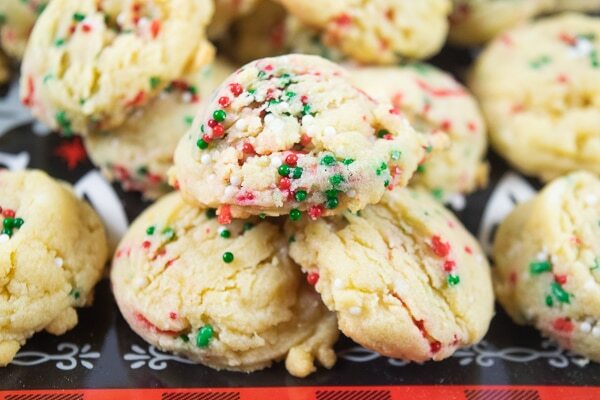 They are perfectly sweet vanilla cookies loaded with two different kinds of Christmas sprinkles. I made a batch of these pudding cookies for my daughter’s Thanksgiving feast a couple of weeks ago and they were a huge hit. After the first round of families serving themselves, the cookies were almost gone. I had to act fast to grab a couple for my own kids. They watched as I made them the night before and didn’t allow a taste – promising they would each get one the next day. It was well worth the wait because these cookies were the perfect treat after a filling meal. I have been thinking about these Christmas Sprinkle Pudding Cookies ever since. 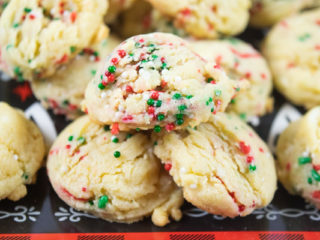 They are definitely going on my list of cookies to make for Christmas. You really can’t go wrong with sprinkles. Plus, if you have never made pudding cookies before, you are in for a real treat. The way I have always heard them described is soft-batch cookies and it is a perfect description. They are soft and cakey with just the right amount of vanilla flavor. You may have already guessed it, based on the name, but the special ingredient in these Christmas sprinkle pudding cookies is instant vanilla pudding. It adds the soft, cakey texture to these cookies. It’s not an ingredient you want to skip – make sure it is the instant variety. Name brand doesn’t really matter with this recipe. I used generic pudding and they turned out perfectly. I used two different types of sprinkles in this pudding cookie recipe. This recipe calls for jimmies and nonpareils – both in red and green Christmas colors (you can grab a combo pack of sprinkles here). It adds an extra layer of texture to the cookie while also making them fun and festive. Preheat oven to 350 degrees. Grease a cookie sheet and set aside. Mix in the egg, egg yolk, and vanilla extract. Mix until light and fluffy. Pour in the instant vanilla pudding mix and mix again. In a medium bowl, combine the flour, baking soda, and salt. Mix. Working in batches, add the dry mixture to the wet mixture and mix until fully combined. Fold in the jimmies and nonpareils. Scoop out golf ball sized cookie dough balls and place on a cookie sheet, 1 inch apart. Let cool on a cooling rack and store in an air-tight container. Cookies freeze well in dough form and after being baked and cooled. 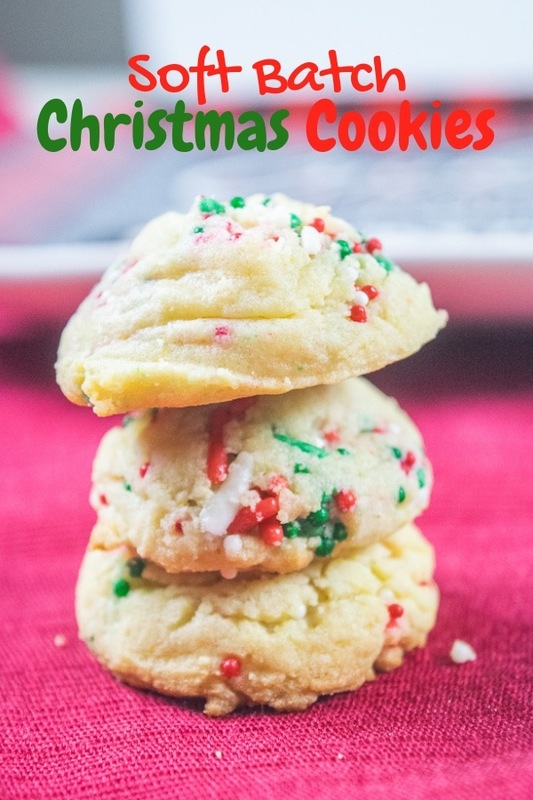 These cookies can be made a few days ahead of time and stored in an air-tight container. They can also be frozen several weeks ahead of time. Just flash freeze them and then store in a zip top bag in your freezer. When you’re ready to enjoy your cookies, simply set them on the counter and let them defrost. You can also freeze the cookie dough to be baked at a later date. You don't want to miss these soft baked sprinkle pudding cookies. 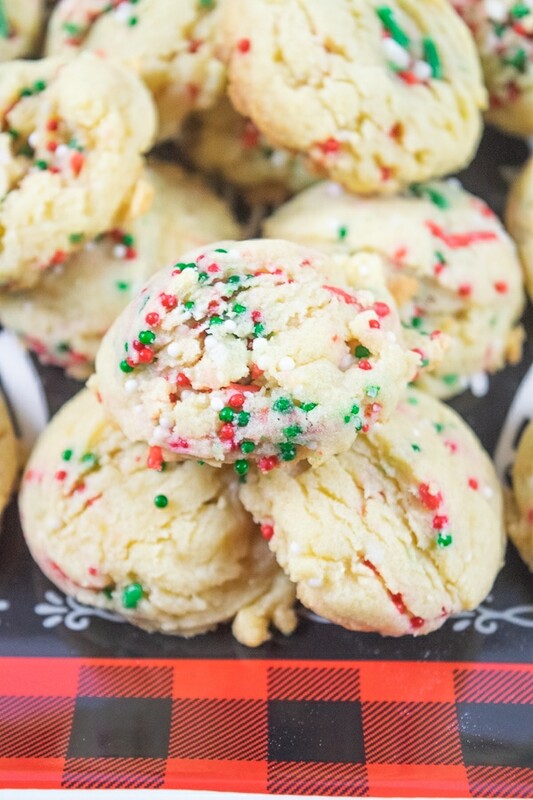 They are perfectly sweet vanilla cookies loaded with two different kinds of Christmas sprinkles. 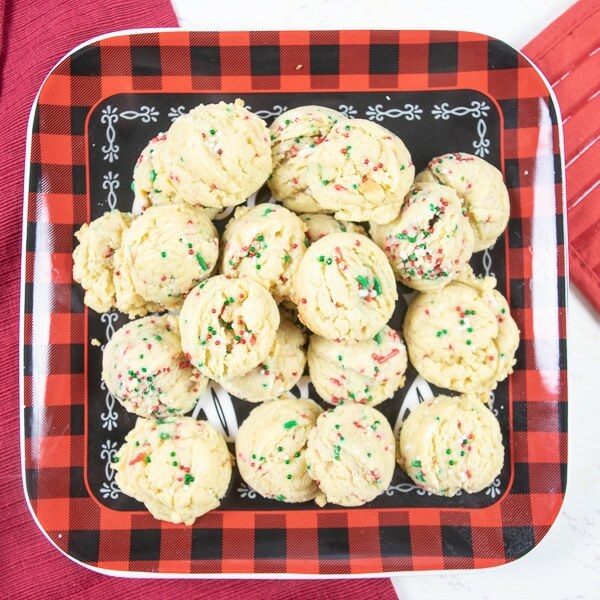 We love a good Christmas cookie and these sprinkle pudding cookies are a great one to add to your list!